Maine Launches the First Commercial Tidal Power Project in the US! Each day, 100 billion tons of water flow in and out of the Bay of Fundy between Maine and Canada with the force of 8,000 locomotives, creating a tidal change of up to 50 feet or more. Now Ocean Renewables Power Company (ORPC) has announced plans to tap this enormous resource by working with The Department of Energy to launch the United States’ first commercial grid-tied tidal power project! The TidGen Cobscook Bay project will generate up to 3 megawatts, which is enough electricity to provide 1,200 Maine homes and businesses with tidal energy. The massive three-part project, which has been in development for the past six years, will deploy power systems in Cobscook Bay, at Kendall Head, and in Western Passage that will be connected to the New England power pool through the Bangor Hydro utility grid. 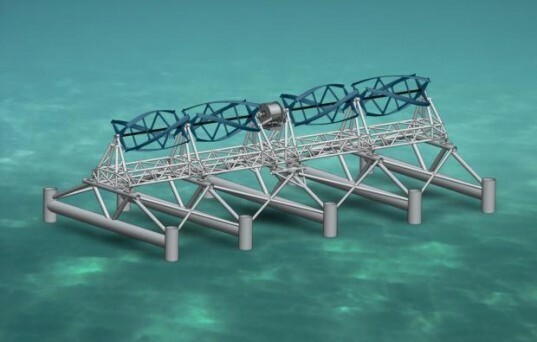 The TidGen Power System is designed to generate electricity at water depths of 50 to 100 feet at shallow tidal and deep river sites. Groups of TGUs connect directly to an on-shore substation through a single underwater transmission line, with each TGU generating up to 150 kW in a 6-knot water current. It is not the first project that the ORPC has spearheaded in the Bay of Fundy region. In 2008, they became the first company to generate electricity from Bay of Fundy tidal currents without the use of dams. The next step was commercializing the ORPC power systems, which happened in 2010 with the testing of the TidGen Power System – the largest ocean energy device to ever be deployed in the United States. Each day, 100 billion tons of water flow in and out of the Bay of Fundy between Maine and Canada with the force of 8,000 locomotives, creating a tidal change of up to 50 feet or more. Now Ocean Renewables Power Company (ORPC) has announced plans to tap this enormous resource by working with The Department of Energy to launch the United States' first commercial grid-tied tidal power project! The TidGen Cobscook Bay project will generate up to 3 megawatts, which is enough electricity to provide 1,200 Maine homes and businesses with tidal energy.